This was my go to tuner for years. I recently updated my iOS and had to update the app. Please tell me how an update can turn a simple tuner that worked flawlessly for me for years into a useless pile a garbage. What happened? The needle display used to move smooth. Now it jumps and jerks. Why on earth would you change this is beyond me. Looking for another tuner I guess. Please change it back. I really used to love this tuner. I make my living as a studio guitarist in Nashville and use this every day for my acoustic instruments. Frustrating. Paid $3.99 for this app on 2 different iPhones (SE and 7). I like the overall look of the app, but with both phones, and both iOS 11 and the recent iOS 12 update, the tuning needle jumps around almost spastically. It’s very hard to get it in tune and very hard to look at. I’m removing it from both phones and going back to my old free tuner. This tuner is EXTREMELY inaccurate on the low and high octaves of my upright piano to the point where it wouldn’t detect the note I was playing. Please keep in mind I set my 8 Plus into my piano or directly overtop the string so there is no reason that the note should not have been heard. Not AT ALL worth $4. This was a very helpful tool to tune my old upright Mallory Piano, especially since I used to tune the piano using one tuning fork. It has never sounded better. Great app. I used this app for years and now it suddenly won’t send sound over through Bluetooth. Very disappointed. Good tuner, but needs an update for iPhoneX. Any timeframe for this? You took away the lock/unlock? I have recommended this app many many times. Tracking is better than most professional hardware tuners. Pitch pipe feature is crucial too! I wish I could still get between notes with it though. Why did the lock/unlock button go away? This app has been on my devices for years because it was the most accurate and responsive tuner out there for iOS. After the update, it has been unusable and inaccurate. I have no problem using the Polytune on my board, but Cleartune was always nice to have in a pinch, or for an impromptu acoustic jam. I hope they get back to the basics and fix the shoddiness and new design of the app so that it is responsive and usable again. I did pay full price for it at one point. Proof that something is wrong. I just pulled out my old iPhone 4 with an earlier version of this app on it and it still works. That’s the app I miss. I put my old iPhone 4 and my newer iPhone SE with the latest version of this app on it (as of 6/16/18) side by side and played a tune. The two year old Cleartune app detected the notes and worked properly. The newer phone with the latest version couldn’t even tell a note was being played even if I put the instrument right up to the microphone. It would only make an attempt to detect my playing if I played the highest notes I could. This was with both apps set to the exact same settings. I don’t know what you guys did, but the app is nearly worthless for me now. Most of the time when I try to change the tuning from 440 to something else it ends up popping right back to 440 as soon as I leave the options screen. I don’t understand why this app isn’t working better than it is. Maybe there is some conflict with iPhone SE or something. I have since moved on to other apps, but I really wish this one still worked. I’m familiar with this tuner, It used to be my best tuner ever,I used it for 5 years but it’s is not as great as it once was, the note doesn’t get picked up as quick as before. It doesn’t really scan quickly. I hate this digital look. Good news is, it’s precise. So please, give us back the analog feel. It has been a while since the last update. 1. Does not do a good job tuning my santoor that is like a hammered dulcimer and has 100 strings, is not accurate and the needles bounces all over the place. I use the tuner in guitar toolkit which works much better. 2. Custom temperaments doesn't really work, my tonic note is D and want to use custom tuning from that, but not working, it is not clear how they are determining the few frequency of the root note. 3. I email them about item #2 months ago, no reply. Pretty much useless app. Why did you remove features? This has been my go-to tuner for years. As a music teacher, I was able to use the app on two different devices side-by-side to demonstrate what it sounds like when two pitches go in and out of tune with each other (using the tone generator). The “unlocking” feature that removes the pitch grid is essential to the success of this lesson because the students could see the wheel move farther and farther away from the pitch and compare it with the sound waves they hear (as the waves get faster, the pitches go out of tune with one another). They LOVED it and it was an extremely effective lesson. This feature has been removed, unfortunately, and now I need to find an alternative app. Very disappointed. I miss the lock button feature. I liked being able to turn the lock off on the pitch pipe and generate tones at any frequency. What happened to my favorite tuner? The update now makes the meter so herky jerky compared to the more realistic movement, it is not only more difficult to use, it is annoying. Ive used this tuner for years. It was great! Now the dial just sits there. Guess I’ll have to use my ears. This is a great app, no question. There were two specific reasons I got it. One was the ability to customize temperament (bagpipe temperament is different than any preloaded setting) and the other was the ability to set A440hz standard to higher than A480hz. On a warm day the band goes over 480. There seems to be some difficulty getting the hz to change though. Often it is ignored and goes right back to its previous setting. It also seems to need to be set one hert at a time to change it. Otherwise it ignores bigger changes. Odd bug. Great app though. I’ve told everyone else in the band about it and some of them have bought it. I just purchased this on a recommendation from a fellow violinist. I’m on iOS 12 on my iPhone 5s. The pitch pipe feature does not work at all. I checked settings, restarted my phone, and even removed the app and reloaded it. Nothing. Can you please tell me how to remedy this problem or give me a refund? Follow up: After 3 days of waiting for a response here in the App Store, I decided to try to contact the developer via their website, but all I got after typing in my message and hitting "send" was an "internal server error" message. so I called Apple support, and Apple issued a refund. Thank you Apple for rectifying the issue. I have always had trouble keeping my mandolin in tune. The string sets never or seldom ever sounded right to me my guitar, mandolin, dobro and banjo have never sounded so good! I triedClear tune in noisy rooms where other tuners failed, and it worked perfectly! In less than a week, I have scrapped my various clip on tuners in favor of this extremely accurate Cleartune tuner. It is worth the money at several times the price!!! I’m very familiar with this tuner, It used to be my best,I used it for 5 years but it’s is not as great as it once was, the note doesn’t get picked up as quick as before. It doesn’t really scan quickly. I hate this digital look. Good news is, it’s very precise. So please, give us back the analog feel to it. I’ve had this app for years and loved it. The latest update has ruined it. Don’t bother. I will be deleting it and finding something much better. 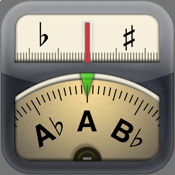 The best iOS tuner for all instruments is back! 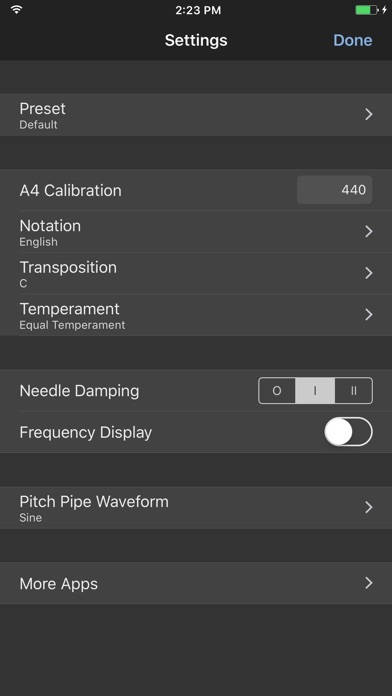 Cleartune has always been the best, most versatile tuner app for all instruments. The best tuner app ever!! Can’t find a better app than Cleartune!! i change the “temperment root key” since on the violin c# isnt d flat, but the app has to be restarted to display the new key at the top, which makes me suspect its not set internally in the mapping from frequencies to notes either! this didnt used to be the case. The older version (before the September 2017 update) ran a lot smoother. The needle didn't have such a harsh waver action. Is there a way to download the older version again?! Please restore full functionality to the signal generator function! Why did full frequency range disappear in this version? I use that every day to dial in reference frequencies. It was great, now its worthless. And the half second lag on the on off button for pitch generator is so annoying!!! Giving one star as of this update v2.2. will return to a great rating when I can generayr any frequency again. I’ve been using this app for a few years and it worked great. But now I’ve been getting “app needs to be updated” messages from my phone for many months. Not sure why they dropped the ball on this popular app. Now, with 11 on my phone, it doesn’t work at all despite the supposed update. (It has access to mic) ... will need to get a different tuner app. I'm a singer and have used this app for 7 years. I like the ability to adjust the temperament, change octaves, and use both the tuning and pitch modes. Like another reviewer noted, the sliding tuning scale is now gone, which sadly makes app useless my purpose, since I work with choirs and often need to work in the cracks between standard pitches. If you just need to tune a single, loud instrument, it'll probably work fine. This expensive IOS version with more languages and more beautiful theme is infinity less stable than the Android’s version that I used the last 3 years. It is simply a shame! I use iPad 2017, iPhone ES, Galaxy S8 and Galaxy Tab 10.1 first model. Incredible!!! I’m a musician who likes to put a tuner up on the stand and play through an entire piece of music to check for any intonation issues. With the newest update, if I’m not actively touching the screen, it dims and locks on me, which I find annoying. The only way around this is to change the settings on the phone to never lock, which I don’t want to do, so I’ve essentially stopped using this tuner and gone back to my old Korg. As I’ve used and loved this app for years, this is a huge disappointment. Other than this issue (which is a huge one for me), the tuner is accurate and useful, but the pros aren’t enough to overcome the cons for me at this rate. Hands down best tuner app out there. Thank you! How sweet. I can breathe again. I’m a professional musician and I used the pre-updated version of this all the time. It’s basically unusable to me now. The wheel is different and seems clunky and inaccurate. The overall usefulness is gone. Time to move on. Plenty of choices out there. Great tuner - ruined by the update! As a replacement for my discontinued Korg tuners, this app has it all and then some. It produces a harmonically rich tone (far more useful for tuning pipe organs, which is what I use if for, than the sine wave some PC programs use) over a very wide range, can be set to various temperaments (including user-programmable ones) and is easy to calibrate. The earlier review complaining about calibration difficulties for organ tuning is just flat wrong. It does require you to calibrate on A if you want to do it audibly; otherwise there is some guess work involved, but that was the case with the Korg AT12 as well. I prefer to tune to a reference tone so I've only made limited use of the meter function - it's not as visually striking as a strobe display but it's perfectly adequate. The recent update to "pitch pipe" mode allowing you to chose notes by tapping the note name rather than spinning the virtual wheel really sealed the deal for me. I've been using Cleartune regularly throughout the holiday tuning season with entirely satisfactory results. On second thought... The recent update, while welcome even if way overdue, has eliminated some very significant features. At least on iPhone the note wheel is way too large and the tap to advance function is gone (pipe organs are often laid out in whole tones so these two features rule out "eyes free" operation). Also, the pitch unlock button is gone and so is the listen to calibrate option. I'd almost given up hope of continuing support for this app, but this update is almost worse than just letting it die. Very disappointing. I find it harder to tune with this new update. I liked how before the arrow stayed yellow until you were in tune and it became green. I don’t like how zoomed in it looks now. The wheel doesn’t move fluently like it used to. It’s overall not good anymore. I am a classical violinist and violist as well as a teacher. I also play other instruments for a hobby. This app used to be perfect whether I was tuning a note that had to be perfect, tuning my violin knowing it had to be exactly in tune with other tuners, or tuning my banjo or tenor guitar. Now the wheel flails aimlessly no matter what the needle damping setting is. I’m not recommending this to my students any longer and probably won’t use it any more myself until I see another update and give it a test drive. I use this app everyday to tune every one. Latest update-the app allows the screen timeout to shut the app down. Why did I loose this functionality? This tuner is excellent. For the money, you won’t find a better tuner for your iPhone. It’s easy to use, accurate and customizable. It had a pitch pipe setting so you can easily listen to any reference tone you like. That being said, I noticed two small differences from the older version versus the new iOS 11 version: 1. The green needle used to turn green when you were +/- 5 cents from the center of the pitch. Now it’s perpetually green. Please change it back to how it was. 2. The pitch pipe used to have a lock setting so that you could set it to any pitch and listen to what it sounds like in or out of tune. Please bring that lock setting back so the pitch pipe works exactly as it did before. No big deal, just hoping the developers see this review and make those changes if they feel the need to. I hope they do. I didn’t value Cleartune until I couldn’t use it for awhile. I tried several alternatives and I learned that some are better than others. Somehow I’m able to tune both more quickly and accurately. 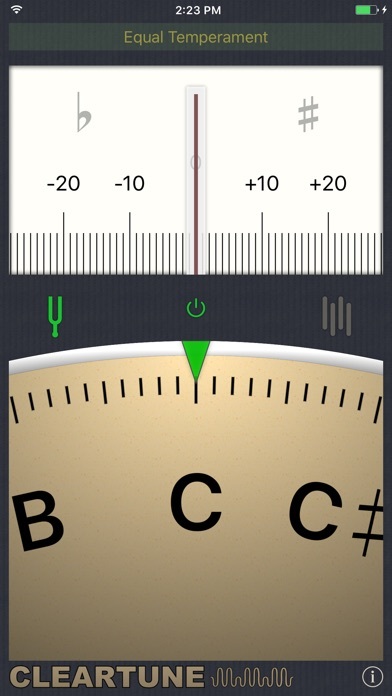 I bought this app years ago and have used it every day for tuning my students. The wheel is too big now and the graphics more cartoonish looking (more 2-dimensional if I’m correct in saying?). The tuning needle stays green all the time now. It used to turn green only when you had the correct pitch which was visually helpful for my students. A step backwards from the older version so very disappointed. I NEVER write reviews so this shows how very disappointed I am. Love this app; Thanks for Updating! For people using this app - I really do love it and it's been great for tuning my guitar and bass guitar. As a full time IT professional I appreciate this App being updated so I can use it and update to iOS 11 to get the security patches. As a musician I'm glad I can keep my guitars and bass in tune. Rock on! Absolutely awesome. I've used this professionally for years to intonate and tune most of my MANY instruments! Update: lowering my rating because the got rid of the lock button that allowed you to use it as a frequency generator. I loved that function and would love it back!! I used to LOVE this tuning app. It was my all time favorite. I just updated it and now it’s all jerky. The continuous tuning wheel and needle used to move fluidly but now when a string is plucked, it jerks around and one can’t seem to settle in on the correct tone until it stops jumping and settles down. I am totally disappointed in the upgrade. I’ve used this app since it was released and it has never let me down. Calibration by sound feature removed. This is very important to how I use it. The update made this app substantially less good. The tuner used to show a yellow icon that turned green when you found the correct pitch. Not essential but sometimes useful and now it’s gone. The speed and accuracy of the tuning seems to have taken a hit with the new iOS update. The biggest gripe however, is that the screen now dims after a minute or two while I am tuning with students and this is wholly unacceptable. I hope they can make the app like it used to be, but I’m going to look elsewhere. Finally it works again !!! I been using this app since the very start I’m so glad it works on iOS 11.keep up the great work!! The earlier version was better, towards the end of earlier version and just before the upgrade problems started.. since the recent upgrade, completely unusable even after deleting and reinstalling.